In truth I find myself in the busiest stage of life I’ve ever experienced, a relentless and impossible month. 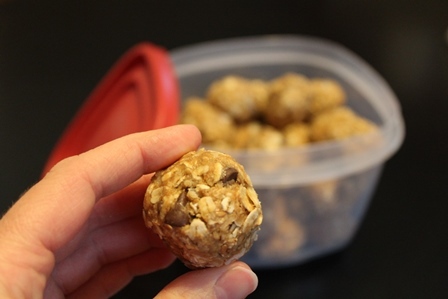 So here’s a recipe for such a time as this—No-Bake Energy Bites, our favorite cookie at the moment. I found this recipe online (there are versions galore), and tweaked and tweaked it until it’s just right for my family. We like a mix of quick oats and rolled. We like milk chocolate chips. We found the vanilla distracted us from the creamier flavors, and began omitting it. Even my kids who don’t like coconut love these little guys. Stir dry ingredients together, then add peanut butter and honey. Stir well. Chill half an hour, then shape into balls. Refrigerate to store. Yield: 40-50 1” balls—enough to last two days at my house if I’m lucky. Of course you could add whatever you’d like to this recipe: dried fruit, more seeds, M&Ms. What would you throw in? Happy eating! May your energy rise to meet the road. Or something like that. Those are my favorite go-to snack as well! I add sunflower seeds, chia seeds and either raisins or cranberries to mine but I love coconut so will have to try that the next time! I just add any nuts or dried fruit I have on hand! With adding dried fruit I found I don’t need as much honey or agave! Thanks for the tip! my family loves these things. I once had a box of grape-nuts cereal which we all hated that was vegetating in the back of the cupboard. I threw them into a batch of these instead of the wheat germ and everyone loved the extra crunch. Haha! Now that might be taking the creativity a little too far. Maybe that’s what I need to do with the granola I made that didn’t pass the test! Or make granola bars with it. Think I’ll try these, or a version of ’em– thanks, Shari. No green beans. Otherwise, we’re good. Yummy! Good chocolate chips are imported and therefore expensive in Guatemala, so I scaled back on the recipe amount and tossed in some chocolate rice cereal. We all enjoyed them. Thanks for the recipe! 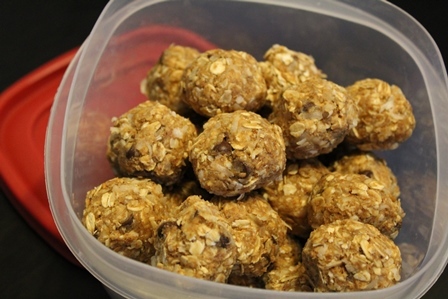 How cool is this… I went to a friends house this weekend and she pulls out these energy balls. She explains that she got the recipe through some blog. She delightfully had all ingredients on hand so she made it for this weekend. As she talked I said, “Wait a minute, what blog?” It ended up being your energy bites. So I got to taste (or eat a bunch, is more like it) without having to make them! 🙂 Yummy! Many times I have opened this post and followed your recipe. They are so easy and good!